Use this guide and helpful hints to prepare your visit to Fuquay-Varina for the 2018 Freedom Balloon Fest. Visit often as we'll be updating regularly. Drink water the night before and on the way to the event - then, plan to stay hydrated at the festival grounds. Wear a hat and sunscreen. Loose, long sleeves help with exposure too. Prep your children as well. If you have health considerations which may limit your capacity to be outdoors for long periods of time, you may wish to consult with your healthcare provider in advance before heading out into the sun. Fleming Loop Park is wide open without lots of shade trees - it has to be in order to have room for the hot air balloons. Fleming Loop Park is 26 acres (large enough to hold 19 football fields) with lots of things to do and see, which means there's lots of ground to cover just seeing the festival. Plan for walking at the festival and getting to the festival grounds. There is no parking at the park. There are a variety of public and private parking lots (including handicap accessible options) within a short distance from the entrance on Judd Parkway. Plan for distances from parking to the event site similar to going to other major events, such as large concerts, football games, sporting events or the state fair, where even the closest parking can be a 1/2 mile from the main entrance. All parking is operated independently at public and private lots near the festival grounds. Festival organizers will offer the a list of parking lots only for informational purposes and attendees seeking convenient parking for their individual needs. 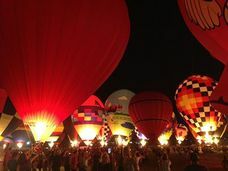 The Freedom Balloon Fest receives no funding from parking. Free public parking lots and on-street parking as listed by the Town of Fuquay-Varina are shown in blue. Orange listings are Paid lots. Yellow lots require a permit in advance. Other details in the table below. Provided for information purposes only. Accurate at time of publishing. The following property owners and groups have information about their nearby property listed as a convenience to those planning to attend the 2017 WRAL Freedom Balloon Fest. This is not a complete list of all available parking surrounding Fleming Loop Park - only those who have asked for a free listing from festival organizers. *Festival attendees are encouraged to visit downtown merchants. If your are looking to park and shop a while in downtown, please observe a 2 hour limit in the Raleigh Street Lot, so that other Festival attendees can enjoy the gracious hospitality of our Host Community's downtown merchants. There's plenty to do and see. Join us for all day fun. Check out our Schedule of Events page. There are dozens of interactive sponsor and military displays, lots of food options, an arts & crafts village, live music on the RE/MAX Stage and more. 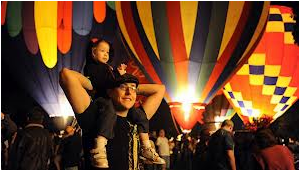 When is the best time to see the balloons? If you want to see balloons in flight, come early and/or stay late. Morning Flights - plan to be at the park at 6:00am. Depending on wind/weather, pilots go out and fly back to the park, or they will launch from the park. Either way, it's best to be at the park right at sunrise. It's called "breakfast and balloons." 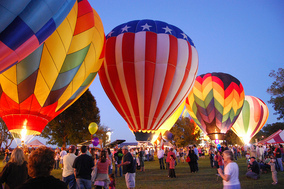 Afternoon Flights - Afternoon mass ascension and tethered rides begin after 6:00p.m. *Flight/tether times are approximate and depend upon wind and weather. Want to ride or fly? Want to take a balloon flight? Learn more. From Downtown Fuquay-Varina at the intersection of Academy & Main Street, the Town of Fuquay-Varina is completing the sidewalk all the way to the intersection of Judd Parkway in time for the WRAL Freedom Balloon Fest. Explore the "walk-ability" of Fuquay-Varina and get to know the downtown merchants of the Fuquay and Varina zones. The festival doesn't operate any public shuttles. Those seeking a lift to see various parts of our Host Community are encouraged to seek private ride booking services options - Fuquay-Varina is a great place to shop, dine and explore! Please note that golf carts and ATVs are not permitted on public streets/roads or sidewalks within the Town of Fuquay-Varina. Leave these on private property. Traffic around Fleming Loop Park is expected to be heaviest each day of the festival from 4:00pm-7:00pm; and again, from 9:00pm-11:00pm. Obey the direction from Fuquay-Varina Police officers and other law enforcement officials who are responsible for directing traffic. It's the law and it's for your safety. PLEASE watch out for their safety as well. Traffic patterns may change based upon law enforement needs and current conditions. Don't wait until the last minute to go to the festival. It's the best way to find parking and avoid traffic. There's plenty to see that's free! Observe all marked crosswalks and please use caution when driving near the festival grounds and expect pedestrians at all times. Just passing through on Highway 401 or Highway 42? We suggest finding alternate routes to go around downtown Fuquay-Varina during the Memorial Day weekend. Please don't litter. Use the appropriate Waste Industries solid waste and/or recycling receptacle. Good shoes! Plan for a day of walking. Think of it just like a trip to the NC State Fair or your favorite college football game. The park is more than 25 acres of open land. Wear good walking shoes. Wear sunscreen. And, bring more to re-apply. There is limited shade at the park. Wear a hat. Bring a folding chair(s) and/or a picnic blanket but keep your items small and light. Need a stroller? We strongly suggest one of the small, inexpensive "umbrella" style strollers. 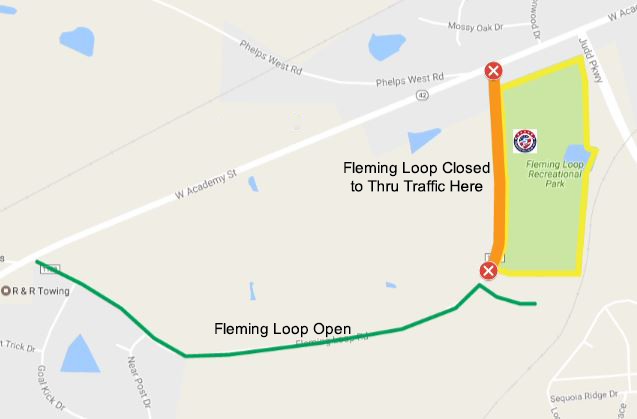 Fleming Loop Road nearest to the entrance of Fleming Loop Park will be closed to thru traffic. Homeowners and visitors can easily access Fleming Loop Road from the west part of Fleming Loop on Hwy 42. ​From the intersection of Fleming Loop Road at Academy to Parkers Ridge Drive is designated as a No Thru Traffic area.